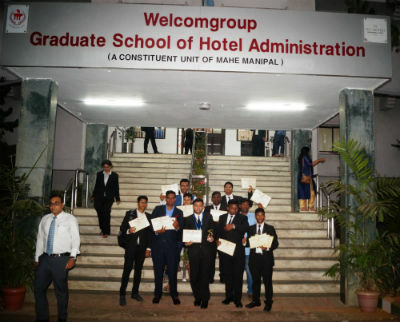 Hyderabad: Ten Students of Pioneer Institute of Hotel Management (PIHM) participated in WGSHA quest 2018 on 28.02.2018-01.03.2018(2days) organized by Welcomgroup Graduate School of Hotel Administration (WGSHA) one of constituent college affiliated to Manipal University as a unit of Dr. T.M.A. Pai Foundation with Welcomgroup, the hotels division of ITC Ltd ITC hotels located at Udupi district, Karnataka. N. Prashanth along with 9 students had participated in the event, where N. Prasahanth won the second prize (runner-up) in the Food-O- Graphy competition. The event is an annual nationwide competition for students of Hotel Management. Various events held at the venue includes Restaurant service skills, Globetrotter, Jeuconcours, Culinaire, Food-o-graphy, wow at every moment of truth, Sherlock it out, Hoteliers got talent, floral flourish. This Hotel Management institute is run by ITC group facilitates training and teaching students in this field. Hotel Management stream is slowly catching up as a most happening profession and every year we see a surge in the number of students opting for the courses offered. India has seen large and premier Institutes offering various options in the Hotel Management industry. With the Prime Ministers Skill India Program even students who opt for Hotel Management as a career have been steadily progressing in this category. Tourism is growing across India and with two tourist’s season every year there is a huge demand for students coming from Hotel Management. About WGSHA Quest 2018 – WGSHA Quest is an event that showcases skills, talents, aptitude, and dexterity of students from leading Hotel Management institutes in the country. The competition emphasizes on real-life scenarios that will help the student to combat possible challenges that may be faced by the student in the industry. The competition also believes in extracurricular activities and host competition that will even nourish the artist in the student.